UVI data is temporarily not available due to sensor maintenance. Some ultraviolet (UV) exposure is important for health functions such as Vitamin D production in the body and treating diseases like jaundice in babies or psoriasis and rickets in adults. However, excessive exposure to solar UV radiation can result in harmful effects to the skin and eyes. 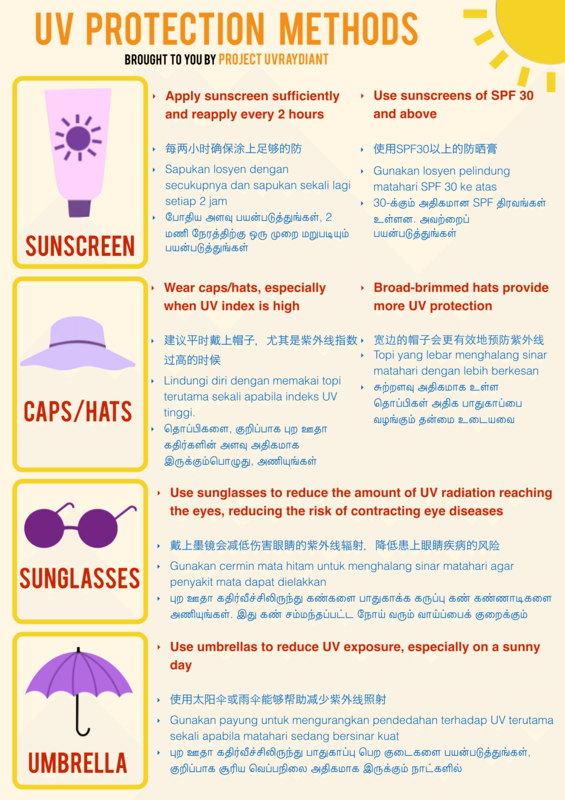 If you must be out in the sun, especially between 11am and 3pm when the UV index levels are highest, the following simple protective measures can help to minimise the effects. The UVI is measured at the Changi Meteorological Station and reported hourly between 7 am and 7 pm. The reported UVI represents its average value for the past hour. In the presence of rain and/or under cloudy conditions, the UVI value is reduced. Therefore the UVI value may vary in other parts of the island.